Reliance Power's Sasan plant: US taxpayers' $900 million "used to support dirty, dangerous coal project"
Titled The U.S. Export-Import Bank’s Dirty Dollars, a statement issued by the Sierra Club on the report says that it “includes accounts from more than 25 local residents who were the victim of relocation, violence, and disappearances and have suffered negative health effects as a result of the coal plant’s construction”. The report particularly takes objection of the fact that “the US Export-Import Bank Office of the Inspector General (OIG) completed its first trip to Sasan last week, where they refused to meet with the affected people in their communities”. Sierra Club is America’s influential grassroots environmental organization, with a claimed support of 2.4 million. 350.org is a global climate movement active online and in the field organizing mass public actions. Carbon Market Watch has a network of 800 members in 70 countries, and carbon markets and advocates for fair and effective climate protection. Pacific Environment, headquartered in San Francisco, works to protect the living environment of the Pacific Rim. And Friends of the Earth US fights to create a focuses on clean energy and climate change. the Government of India, each with a capacity of 4,000-megawatts or higher. Of the six initial sites proposed, only two projects are currently functioning — Tata Mundra and Sasan — and both have raised serious human rights and environmental concerns." The Tata Mundra in Gujarat UMPP, funded by the International Finance Corporation, a World Bank arm, is under sharp attack for failing to take care environmental and livelihood concerns (click HERE to read). "In late 2012, India’s Comptroller Auditor General’s office (CAG) released an audit report on the UMPPs, condemning the government for letting project developers dictate the terms of construction. Instead of providing oversight, the government has been simply tracking the projects’ progress, allowing large scale violations to continue unchecked. In addition to discrepancies in land use, the CAG’s report also found that a lack of transparency and fair play has dogged the projects from start to finish", the report points out. “Indian civil society organizations and US-based groups have repeatedly alerted Ex-Im to the grave human rights violations taking place at Sasan, but the Bank has continually turned a deaf ear. The affected communities will not be silent. These are the stories Ex-Im and the OIG attempted to mute,” said Nicole Ghio, a campaign representative of the Sierra Club’s International Climate Programme and one of the report’s authors, immediately after the release of the report. 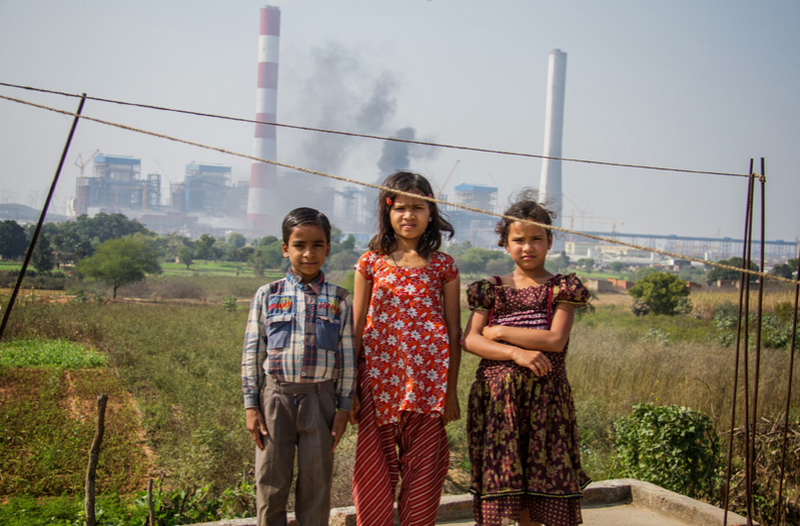 “This report exposes the dangers of coal and investments in it in India. Reliance's repeated transgressions and Ex-Im bank's blind eye to them is totally unacceptable. The impacted people of Sasan and their families are demanding justice," added Payal Parekh 350.org's Global Managing Director who partook in the fact finding mission to Sasan earlier this year. “Despite the shocking evidence presented in the fact-finding report, the Sasan coal power project remains registered with the United Nation’s carbon offsetting mechanism designed to reduce emissions and contribute to sustainable development. The findings of this report need to be addressed in the upcoming climate change conference in Lima,” underlined Eva Filzmoser, director of Carbon Market Watch. “Despite these allegations, the coal project is shrouded in secrecy. Ex-Im has repeatedly refused to provide monitoring documents for Sasan, disregarding its own due diligence procedures and federal legislation requiring that these documents be made available upon request”, the Sierra Club’s statement insisted. Meanwhile, the Sierra Club has submitted a Freedom of Information Act (FOIA) request to gain access to all records pertaining to Environmental and Social Management Plans for Sasan. “This includes the supplemental environmental reports -- encompassing both the remediation or mitigation plans and related monitoring reports -- Reliance Power is required to submit for each coal project. Ex-Im has 30 days to respond to the request”, the statement said.